Bespoke Buffer Vessel & Bespoke Magnetic Low Loss Header Supply. The Supaflex Division of Interflex Hose & Bellows Ltd has recently supplied a Bespoke Buffer Vessel and a Bespoke Magnetic Low Loss Header in the plant room at the 76 apartment Abbeyfield Green Care Home, at Wellbrook way Girton, on the outskirts of Cambridge. 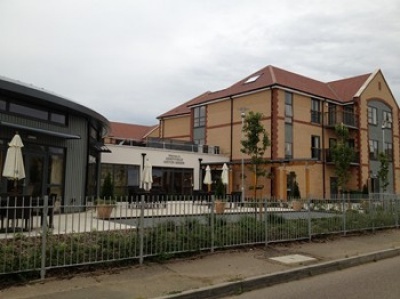 The Care Home opened in early Summer 2012. 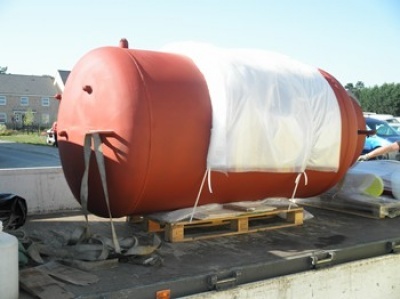 The 2500 litre buffer vessel is seen lying on its side on the pallet on the delivery truck with the Magnetic LL header partially visible packed on the pallet behind. Unfortunately we did not get the opportunity to photograph them ‘in situ’ before the lagging went on. The picture of the Magnetic LL header is similar. The Magnetic Low loss header saved the contractor adding a separate Microbubble Air & Dirt Separator. The magnetic probe increases Magnetite removal down to 5 microns and even below with non ferrous particles down to 10. The standard Microbubble Air & Dirt Separators normally remove ferrous and non ferrous particles down to 10 microns.